NOVEMBER 2018 • FOODSERVICE EQUIPMENT & SUPPLIES • 59 chain prole Deck Byline its smaller footprint and more efcient kitchen helps the restaurant better accommodate off-premise diners, especially drive-thru guests. "We're an old brand but we don't want to be old and tired," says McCann. "We need to be a little more contemporary and appeal to as many guests, young and old, as possible." Contemporary and Comfortable Nathan's more contemporary appearance starts with its exte- rior. The chain's signature colors have long been yellow, red and green (or mustard, ketchup and relish, if you prefer) with yellow being the dominant color. While the redesign uses all three colors, the building now features a vibrant green meant to catch the eyes of those driving by. The building's facade features towers in Nathan's signa- ture green, with the logo on top. The structure also has a set of LEDs that can display green, as well as colors for other events, such as red, white and blue for the Fourth of July. Exterior signage communicates its menu. "We're more than just hot dogs. Some people don't necessarily know that. On the outside of the restaurant we say hot dogs but also cheesesteaks and seafood and burgers and fries. We're purposely putting those out there to communicate menu variety," says McCann. Green serves as a major color on the restaurant's interior, as well, appearing most conspicuously on the restaurant's Heritage wall. Here, glossy green laminate serves as the backdrop for a collage of historical Nathan's photographs. These images include pictures of the company's founders and a well-known Nathan's restaurant in Oceanside, N.Y. 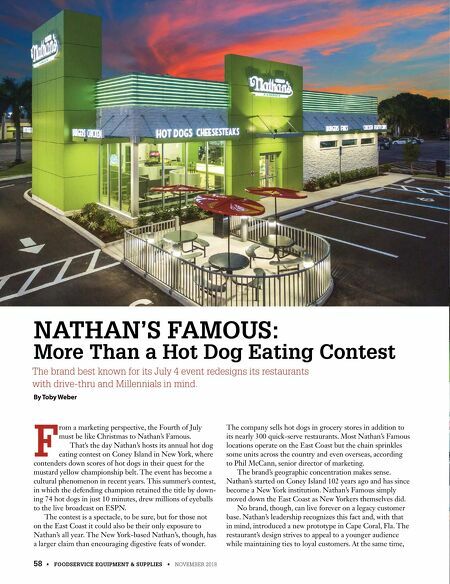 According to Oliver Powers, the chain's senior director of franchise operations, these images also appear in every free- standing and in-line Nathan's restaurant. Here, they serve as a connection between old and new. "We look contemporary and modern, but they left enough elements where you look and say, 'aha, I get it.' The people that know us say 'It's still the Nathan's I know. I see pieces that I recognize,' " he adds. The design features some more subdued elements, too. Wood grain porcelain tile serves as "ooring, while a green painted Nathan's logo splashes across a white brick wall. The chain introduced soft seating in gray, which appeals to both older guests who want comfort and younger ones who tend to linger. Seating areas also feature charging stations. While the chain improved its seating, it also limited the total number of seats. 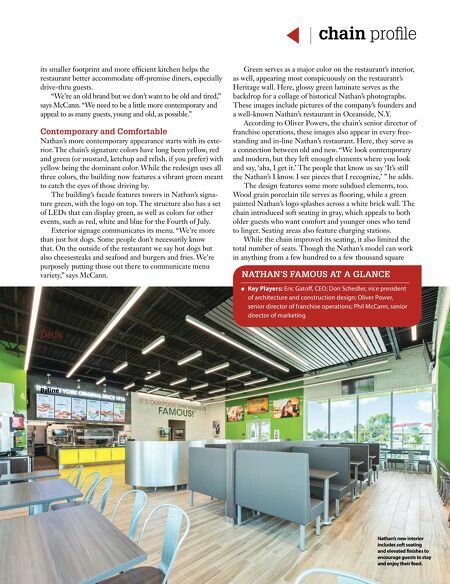 Though the Nathan's model can work in anything from a few hundred to a few thousand square O Key Players: Eric Gato, CEO; Don Schedler, vice president of architecture and construction design; Oliver Power, senior director of franchise operations; Phil McCann, senior director of marketing NATHAN'S FAMOUS AT A GLANCE Nathan's new interior includes soft seating and elevated nishes to encourage guests to stay and enjoy their food.